Shortlisted for the Nordic Council Children and Young People’s Literature Prize! Have you ever kept a night diary? A beautifully touching picture book about a boy who is allergic to daylight but finds his solace in the night. Instead of a journal, six-year-old Moon keeps a night diary. Moon can’t abide daylight; if he ventures outdoors in the daytime, he has to wear a real-life spacesuit. 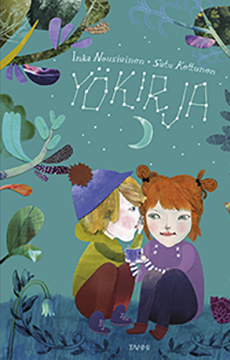 Satu Kettunen is spot-on as illustrator for Inka Nousiainen’s multifaceted story: the shimmering illustrations bring radiance to the night colors, inviting readers of all ages in for an adventure.